I, Angela (Gela) Tölken am of German descent and was born in 1981, in Windhoek, Namibia. 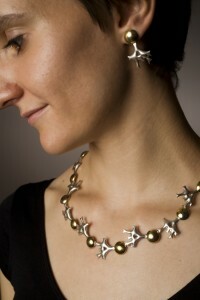 In 2000 I moved to Stellenbosch, South Africa, to study Creative Jewellery Design and Metal Techniques at the University of Stellenbosch, graduating with my Masters in Arts in March 2006. Throughout my studies I was particularly interested in the creative process as a means of self-expression – a fascination which continues to determine the focus of my creative practise at present. I tend to create my jewellery with all my heart and soul, the pieces inevitably telling stories about me in the end. Over the past years I have participated in numerous group exhibitions in and around Cape Town, and have successfully shown my work at three solo exhibitions. In 2008 I was nominated as one of 1000 worldwide contemporary jewellers for Andy Lim’s “Compendium Finale of Contemporary Jewellers” project – a massive 2 volume book published by Darling Publications in 2009. I currently live and work in Stellenbosch as a free-lance art jeweller and a part-time staff member of the Division for Creative Jewellery Design and Metal Techniques of the Visual Arts Department, University of Stellenbosch.